JOEL BECK (1944-1999). "Smiling Face Emitting 'Joel.'" Medium: Charcoal or black crayon and pen and ink on construction paper. Dimensions: 8.5 x 12 inches. Not signed or dated, but believed, from the style and the dates of other Joel Beck items in consignor's collection to be drawn in the late 1960s. Though the face is emitting (or biting) the word "Joel," we do not believe this to be a self-portrait. 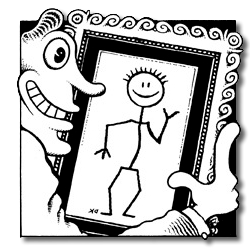 See Beck's self-portrait button for confirmation. Probably unpublished. but tape residue and pin holes indicate that it was on display, probably in the artist's studio. Condition: As the scan indicates, there are edge tears, particularly on the left side, and two creases in the lower left corner. There are seven thumbtack holes at the top (in three clusters) and one at the bottom. A piece of rolled-over masking tape remains at the bottom reverse, suggesting that it was once thus mounted. There is some light staining on the left margin and overall signs of discoloration, probably from being exposed to the sun in the garret of this often-starving pioneer underground cartoonist. Provenance: Certified to be from the collection of a childhood friend of Beck.